Heat wok or 10-inch skillet over medium heat until hot. Add 1 tablespoon of the oil; rotate wok to coat side. Add mushroom; stir-fry 1 minute. Add bean sprouts, onions, rice and pork; stir-fry about 5 minutes, breaking up rice, until hot. Push rice mixture to side of wok; add remaining 1 tablespoon oil to wok. Add eggs; cook and stir over medium heat until eggs are thickened throughout but still moist. Stir eggs into rice mixture. Stir in peas, soy sauce and pepper. Cook until thoroughly heated. 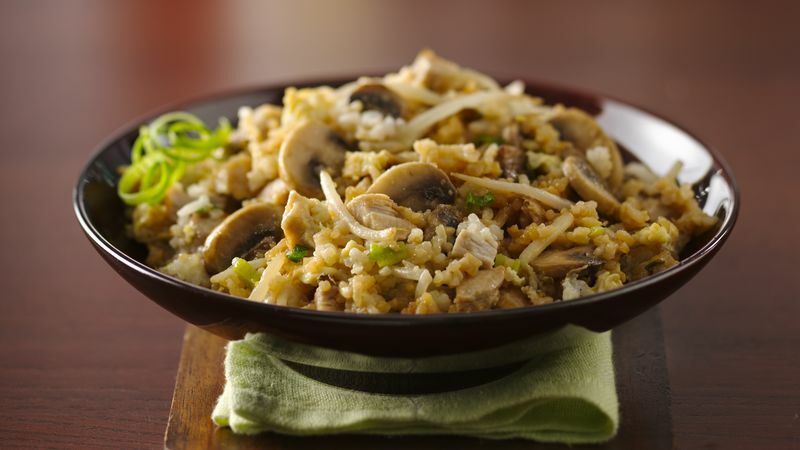 Save time - make this rice the night before and refrigerate. Just heat up the wok and stir-fry the rice to heat through when ready to serve.